From Exclusionary to Inclusionary: How Can We Make Our Region Inclusive, Resilient, and Vibrant? Missed our 2017 Built Green Conference? Check out this exciting panel on inclusionary zoning featuring Seattle mayoral candidates Cary Moon and Jenny Durkan, Seattle City Council candidate Teresa Mosqueda, the founder of Sightline Institute Alan Durning, and moderated by Aaron Fairchild, the CEO of Green Canopy Homes. It's no secret that our region is experiencing a sharp rise in housing prices and that many people are suffering from high housing cost burdens. Due to the affordability crisis, people are being displaced and are unable to easily access services and employment close to home. Seattle’s workers are sprawling into outlying communities, threatening the bioregional resource-base needed to maintain resilient communities. These impacts are felt more sharply by moderate- and low-income households, as well as within many neighborhoods that historically have been home to communities of color. Seattle’s real estate past contributed to the makeup of neighborhoods and zoning regulations that are causing ever-rising costs and displacement in inequitable ways. This session covered Seattle’s real estate and zoning history, how it shaped the city and region as we know it today, and how we can play a role in making our region more equitable, affordable, and livable. The time has come: Built Green is rolling out checklist updates! What are these, why do we do them, and what do you need to know to keep your projects current? Read on to get all of the answers. There are two checklist updates being rolled out right now. One is updating the single-family/townhome checklist to reflect the newest state energy code. The only changes pertain to the energy requirements. The other is a complete revamp of the multi-family checklist. View the updated checklists. How do I keep up with these changes? Again, all projects enrolled with Built Green after these dates will have to use the updated checklists! Certification packets for projects received by Built Green after these dates will have to use the updated checklist, irrespective of their enrollment date. Multi-family projects are given more time to certify under the old checklist due to the longer timeframe these projects generally require due to their size and complexity. Built Green will be sending out plenty of reminders as these various deadlines approach. Please pay attention to these communications! Homes in the Issaquah Highlands, most of which were built under the previous two iterations of the Built Green single-family checklist. A home by McDowell Design Build, certified Built Green in June 2017—see the case study. Why do you update the checklists? Built Green is a relative certification system; projects are judged based on the building environment and code at any given time. Checklist updates take into account code changes, how widespread processes and products have become, new technologies, and current costs. For example, our checklists require that projects are modelled to demonstrate a certain percentage of energy efficiency compared to current code. As code updates, so must Built Green checklists. Otherwise, Built Green certification would lose its meaning as code requirements caught up with the program. The aim of this voluntary certification is to recognize builders who go above and beyond, after all! This means that a 4-Star project certified in 2007 isn’t the same as a 4-Star project certified in 2017 in terms of environmental rigor when compared with each other, but that the cost and effort needed to complete each project given the context of its time was roughly the same. This relative grading system also means that Built Green provides builders with a framework to improve their product over time. A builder that commits to only building 5-Star homes will have to constantly innovate and adapt to continue to achieve this star-level over the years as the rating gets more rigorous over time. But this means that Built Green is helping to spur adoption of new technologies and techniques, and that builders who are dedicated to staying ahead of the curve are supported and rewarded for their endeavors! How do you update the checklists? We don’t do any of this alone. In fact, we heavily rely on the generosity of many different industry experts who support the program. This ensures that a variety of perspectives contribute to the checklist updates. Since this single-family/townhome checklist update was only regarding the energy requirements, we worked with energy modeling experts and third-party verifiers to ensure that our new modeling protocol is robust and that the updated requirements strike the balance of being challenging without being too onerous. We worked with other local Built Green programs in different parts of the state to make sure that the various star-levels on offer also correspond with local markets and incentives available for energy efficiency, so Built Green builders can more easily demonstrate their projects qualify. To update the multi-family checklist, we worked with a committee consisting of representatives from the public sector, consultants on green building, third-party verifiers, energy modelers, and builders. This team spent a year taking the checklist to the next level! Just a couple of things! First, the corresponding multi-family handbook update is forthcoming and will be published soon. It will be available online, for free, as a PDF. Second, it is important to discuss these updates with your third-party verifier to make sure you are on the same page about the transition and deadlines that you have to meet for current and upcoming projects. Finally, we know that—though necessary—these transition periods can be a bit confusing and hectic. Don’t worry! Built Green staff and third-party verifiers are available if you have questions, so don’t hesitate to reach out. Now, let’s keep working to make the green building industry better every day! By Zoe Ludwig, Built Green Intern | This is part one in a three-part series. Back in the day, the West Coast was expansive, idyllic—the land of the American Dream. The privileged few would leave everything they had, come to large open pastures, and build homes for their families for generations to come. But even then, we struggled with zoning, it just had a different name. A history of discriminatory practices negatively impacted marginalized communities for centuries. Believe it or not, it existed here at home: think along the lines of Native Americans pushed out of their homes or non-white communities exiled to less favorable parts. Of course, nowadays, building in the west looks a lot different, as does the American Dream. Every beam laid is permitted; every building has its place; and, ideally, nothing is built out of place. The notion of zoning, however, while transformed, has stuck around. Los Angeles was the first to adopt a policy of exclusionary zoning in 1908, but it wasn’t until 1922 that the Federal Government passed the Standard State Zoning Enabling Act. This act granted states the power to zone cities however they deemed fit and officially legalized exclusionary zoning. While there are many forms of exclusionary zoning, put most simply it prohibits development of anything besides single-family homes on large lots in specific geographical strata (neighborhood, town, city, etc.). The property-tax/education paradigm manifests itself in test scores. One author, looking at "low-scoring" schools and "high-scoring schools, found that homes in the "high-scoring" regions cost, on average, $11,000 more a year than homes in the "low-scoring" regions. This is not only unfair to kids in the low-earning, low-scoring districts, but it is unfair to the rest of the community, which loses the incredible potential from many students who aren’t granted the same resources. Another study found that just a $100 increase in median rent causes a 15 percent increase in homelessness for adults already living in poverty. With the lack of affordable rent options here in Seattle, this statistic is yet another reason to examine our current zoning and its impacts. While it is possible to prove with significance the economic disparity caused by zoning, studies on race are not as straightforward. Bruce Harrell, the only black Seattle City Council Member, put it eloquently when he said, “housing policies are largely governed by socioeconomic patterns. Yes, we can agree there’s a huge overlap between poverty and communities of color. But to suggest that… there’s a conscious attempt to exclude in terms of zoning decisions based on race—that almost distracts from the issue.” It is still important to note, however, that while race might not alone dictate housing disparity, the overlap of poverty and communities of color, combined with various systematic failures and the continuing ramification of past housing injustices, create an undeniably unsustainable system in which the rich and the white frequently end up on top. If we focus zoning reform on creating affordable living options for all, we will make progress in addressing disparities and affordability. Interested in this complex topic? At this year’s Built Green Conference, we are hosting a panel called From Exclusionary to Inclusionary: How Can We Make Our Region Inclusive, Resilient, and Vibrant? featuring Alan Durning of Sightline Institute, candidates for Seattle public office, and experts on environmental justice and community participation. Register for the conference today—ticket prices increase September 1! Founded in 1999, the Built Green Program has grown a lot in the past 17 years. To date, Built Green has certified over 16,618 projects, representing almost 30,000 units. 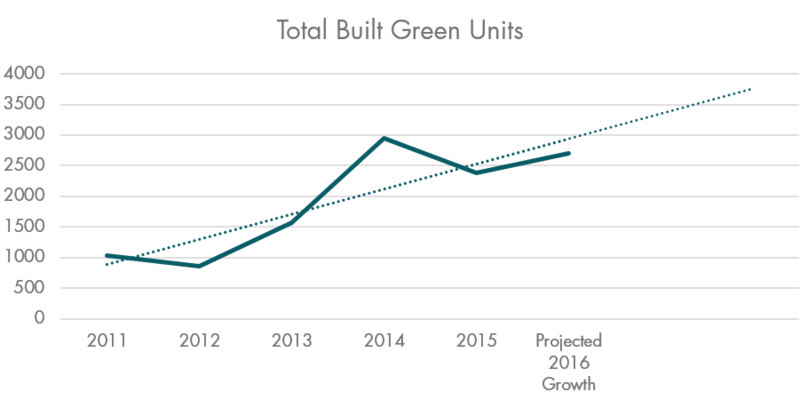 At Built Green, we’ve focused on growing in many different ways, but there are three core growth dimensions Built Green is especially proud to see on the rise. 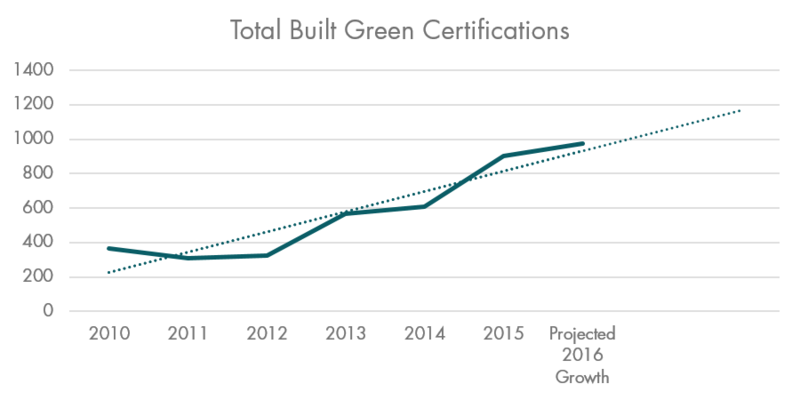 During Built Green’s first full year of certifying projects in 2001, 700 projects were certified Built Green, representing 971 units. Before the recession, Built Green™ was experiencing large volumes of project certifications. While the crash absolutely affected the program, we’ve been growing ever since, even in spite of the program also growing in rigor (such as updated checklists and third-party verification being required at all levels). Last year, in 2015, more than 900 projects were certified Built Green, representing 2,387 units. This year, we’re on track to beat last year’s numbers by a significant margin. With over four months left to go in 2016, Built Green has already certified 634 projects this year, which represents 1,578 units. While Built Green certified a fair amount of projects in 2001 (700 projects), all of this work was done by only two builders: Quadrant Homes & Habitat for Humanity. One of Built Green’s core objectives is to be an inclusive program, available and appealing to all builders whether they’re constructing multifamily homes or single-family homes, or doing a remodel or another type of home building project. In 2005, when the housing market was on the rise, Built Green had expanded its reach more than 10-fold: During 2005, 26 builders certified more than 1,200 projects. 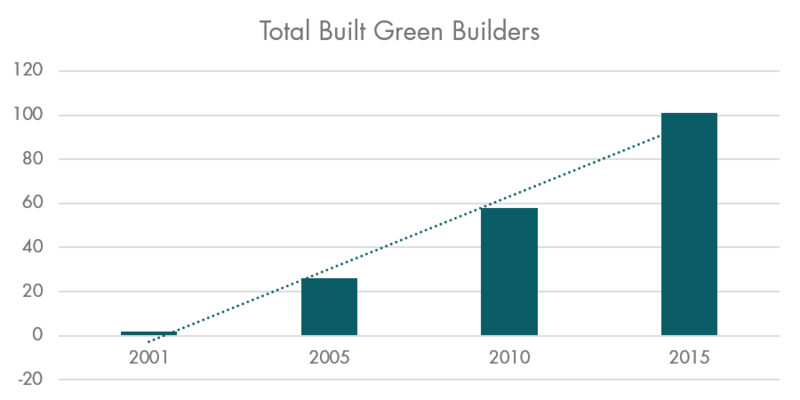 Even better, the number of builders using Built Green to certify their projects has only continued to increase as the Built Green program gains legitimacy and recognition, as builders increasingly grow to see the importance of environmentally-friendly construction, and as demand continues to shift towards more sustainably built homes. From 2001 to 2015, the number of builders increased almost 50-fold, with over 100 builders certifying their projects last year. 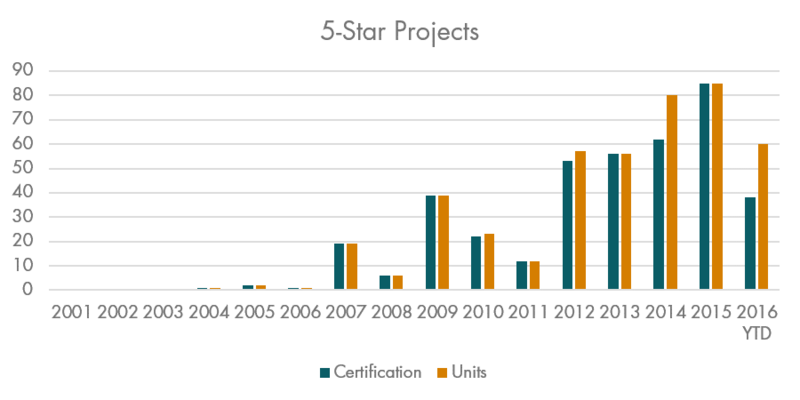 When the program started in 2001, there were no 4-star or 5-star certified projects completed – only 2-Star and 3-Star. In fact, the program hadn’t even created parameters for these higher levels yet. 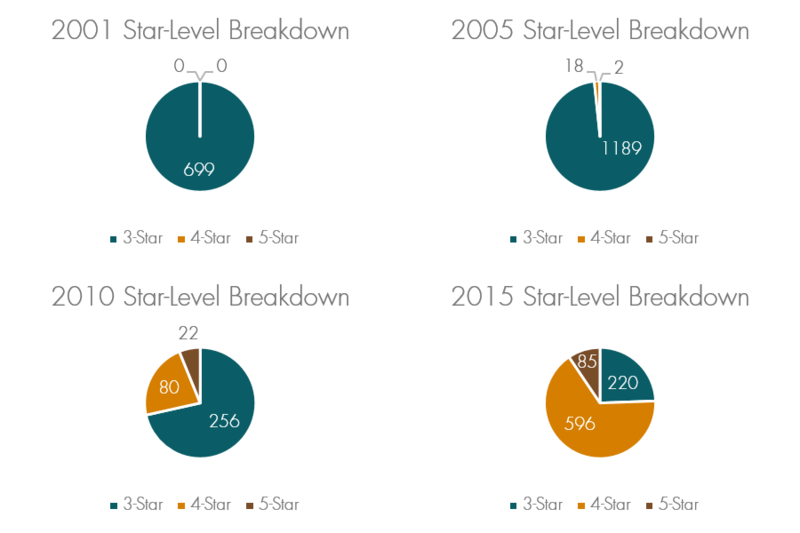 But, as can be seen in the graphics below, over the years, more and more builders are shooting for ever-higher star-levels in their projects. 5-Star projects in particular are on the rise, as can be seen in the very bottom graph. 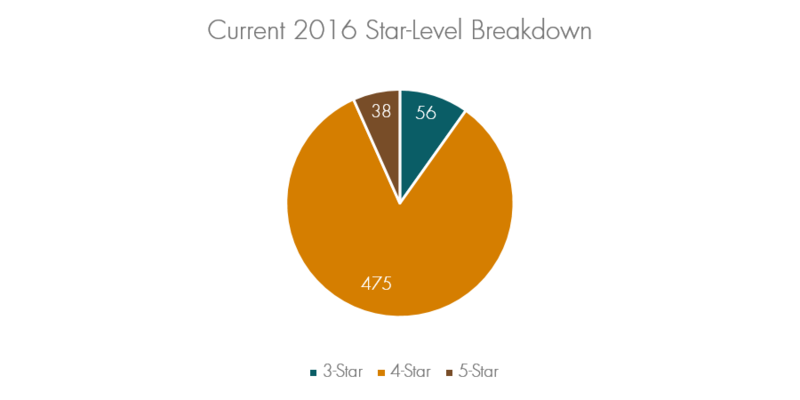 At the moment, 4-Star makes up the bulk of our certifications, despite it representing a significant jump in requirements from 3-Star. Higher star-levels indicate increased energy and water efficiency measures, homes built with a larger amount of sustainable materials, and homes that will have better indoor air quality.